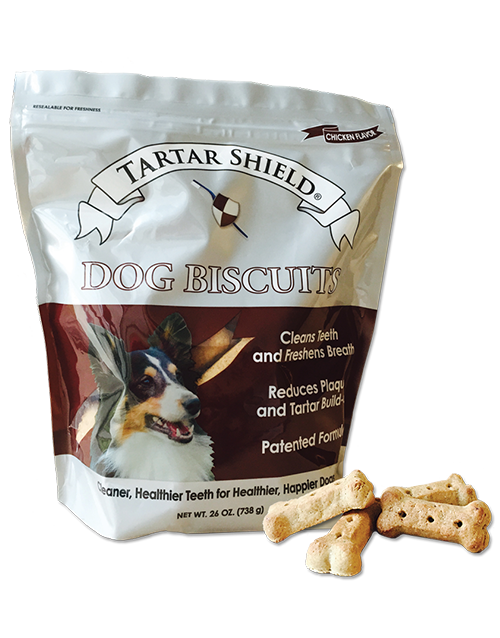 For cleaner and healthier teeth, reward your dog with Tartar Shield Dog Biscuits. Each tasty treat contains Malic Acid, a naturally occurring ingredient found in citrus fruits that work in a patented formula clinically proven to significantly help prevent plaque and tartar build-up, reduce bacteria and clean teeth. Malic Acid also acts as a flavor enhancer, making Tartar Shield Dog Biscuits a savory treat your dog will beg for! 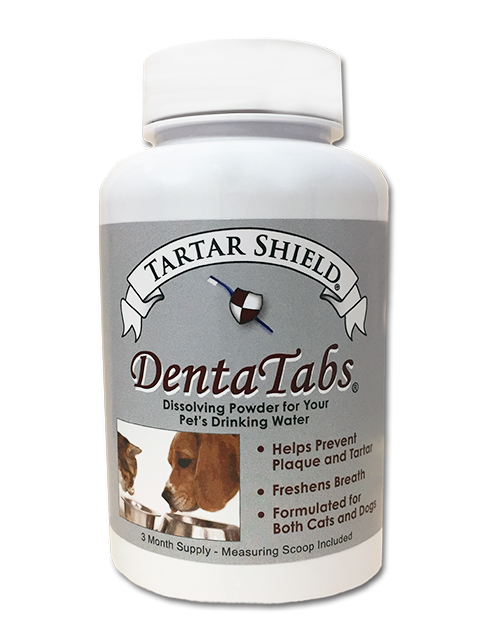 Tartar Shield Dog Biscuits were clinically proven to significantly reduce tartar build-up through independent research conducted at Indiana University School of Dentistry. Studies showed that dogs treated with malic acid, which is present in Tartar Shield Dog Biscuits, had 32% less tartar build-up than those not treated with malic acid. 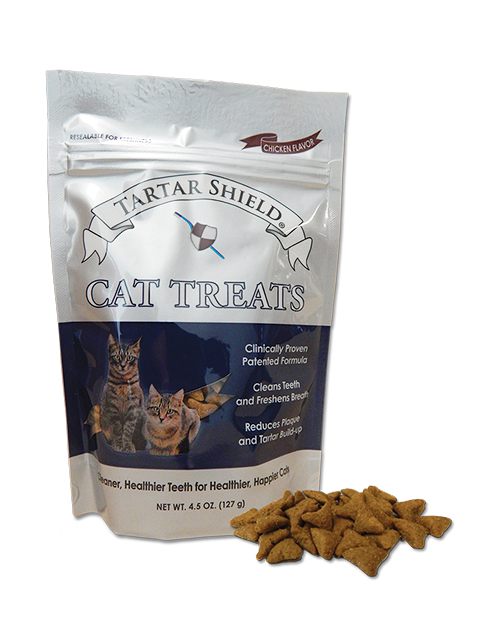 Give your dog Tartar Shield as a tasty treat or reward. To help keep teeth clean and reduce tartar formation, feed 2 biscuits daily in addition to a normal diet. Tartar Shield Dog Biscuits are a wholesome treat fortified with essential vitamins and minerals in a tasty chicken flavor. 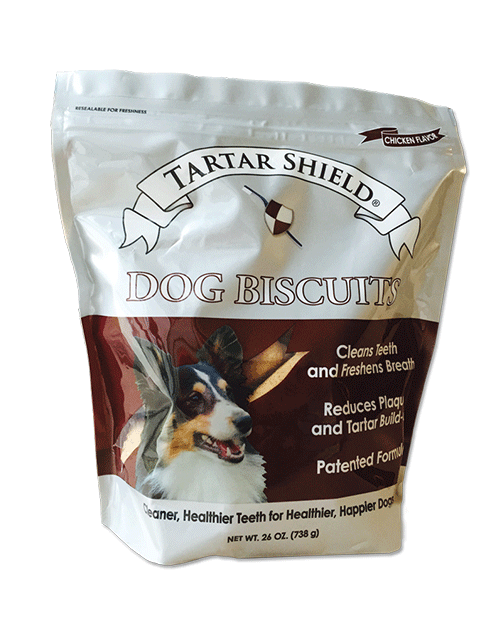 Tartar Shield Dog Biscuits are available in one size and are suitable for small or large dogs. 26 oz. Package. Wheat Flour, Poultry By-Product Meal, Corn, Wheat, Corn Gluten Meal, Poultry Fat (Preserved with Mixed Tocopherols), Chicken Flavor, Calcium Carbonate, Salt, Malic Acid, Potassium Chloride, Cheese, Choline Chloride, Vitamins (Vitamin E, Vitamin B12, Vitamin A, Niacin, Calcium Pantothenate, Riboflavin, Vitamin D3, Thiamine Mononitrate, Pyridoxine Hydrochloride, Folic Acid), Minerals (Ferrous Sulfate, Zinc Oxide, Zinc Proteinate, Copper Sulfate, Copper Proteinate, Manganous Oxide, Manganese Proteinate, Calcium Iodate, Sodium Selenite). Preserved with Mixed Tocopherols, a Natural Source of Vitamin E and Citric Acid. Each biscuit contains 47 calories. 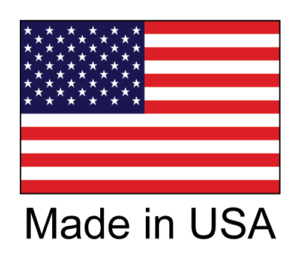 Made in the USA with US ingredients. 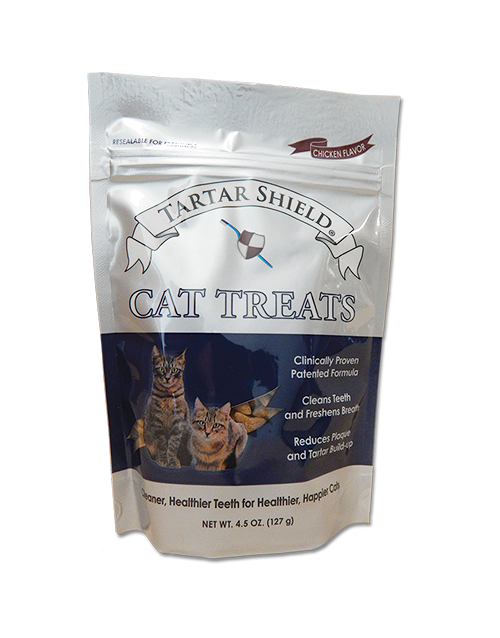 Tarter Shield products were recommended by a veterinary dental specialist….she was on point. After my 3 year old Goldendoodle broke 3 teeth from other chew treats, and surgery to have those teeth pulled, my Vet recommended Tarter Shield Rawhide Chews and the Biscuit Treats. My dog loves the treats and she has not had any broken teeth since. Thank you Tarter Shield. Have been giving these to my dogs since my vets recommendation last year. The dogs love them. My only complaint is they only come in one flavor, chicken. I can tell at times they lose their enthusiasm for them. I would love to see a beef as well a liver flavor. 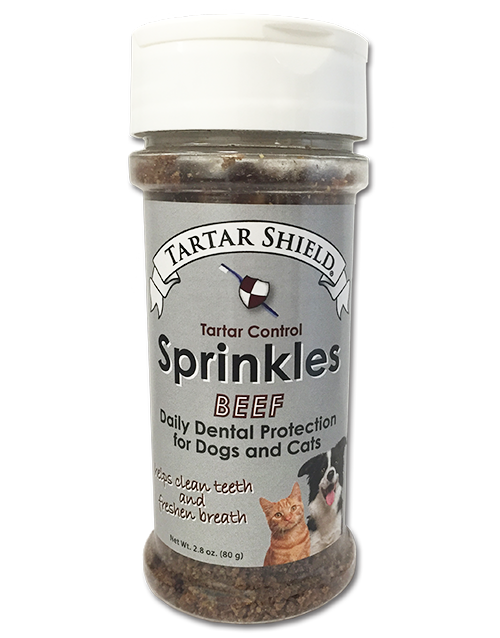 My dogs have been eating the dog chews and treats now for many years and they love them, Our older dog had a lot of tartar on his teeth. We started brushing his teeth and gave him these items and he no longer needs a dental. Amazing change. We started our puppies on these right away. Love these products and so glad that our dog dentist recommended these. Reordering again. Always have some on my “dog shelf” and they get one each morning after we return from our first two a day walks. But again, how about a little variety. Besides chicken how about a beef and/or a liver flavor? ?